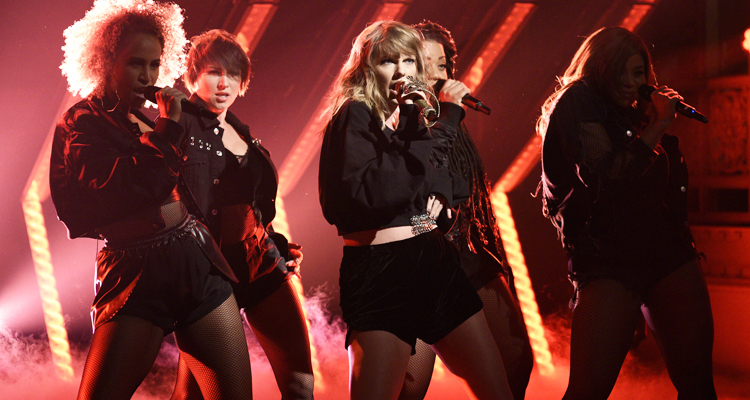 On Saturday, Swift was the musical guest on Saturday Night Live, performing both “Call It What You Want” and “…Ready for It?” from her new album Reputation. First taking the stage in a black sequined sweatshirt and short-shorts, Swift delivered a lively rendition of “…Ready for It?” the second single released ahead of album’s launch. Swift continued her new snake motif by clutching a gold microphone in the shape of a serpent as backup dancers joined her onstage. For her second performance of the night, Swift picked up her acoustic guitar and sang into a Reputation-branded microphone for a stripped down version of “Call It What You Want.” A cellist and four vocalists back Swift for the track, which is rumored to reference ex-boyfriends and her feud with Kanye West and Kim Kardashian; keeping with the theme of the song, for the SNL performance, the singer wore a shirt with a picture of a snake on it. Watch all the performance clips below. Today, Swift announced a stadium tour in support of Reputation in December. The album sold over 700,000 streaming-less copies on Friday on its way toward going at least platinum in its first week of release.